First thing noticed on entering the White Swan in St Albans for the first time is that the selection of real ales is better than expected. Three real ales were available, Green King IPA and two guest ales, one of which included Bitter and Twisted. The choice of wines was rather limited. Other than the choice of real ales the thing that is very noticable about this pub was how smokey it is. This will of course change in July 2007 when the ban comes in. Most seating is available to the right and back of the pub. This is actually quite a pleasant pub. It has a nice friendly atmosphere, it's comfortable and the music on the jukebox was very good (80's pop/rock) without being too loud. Don't look at the outside of this pub and think it's nothing special, pop in and try it out - especially after the smoking ban on 1st July. Ales available at this visit were Green King IPA, Thwaites Gold and Ringwood Best. Three ales available including Brains SA and Pride of Pendle. Pub was busy on a Friday night without being crowded. Vast majority of drinkers were male, many of whom were playing darts or bar billiards. A pleasant traditional pub. Closed - Opened in Sept 2010 as Oscar's. 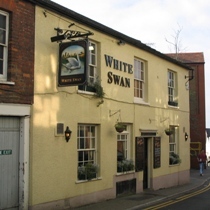 Re-opened in August 2011 and back to its original name - The White Swan.